SolarReserve has participated in two extremely well-organized and worthwhile business development trade missions led by U.S. Secretary of Commerce Penny Pritzker. The first mission was in March to the Middle East, focusing on export opportunities for U.S. companies in the infrastructure sector, including renewable energy. 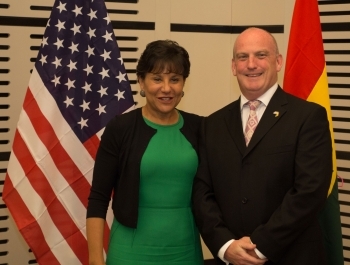 Based on the great success of the Middle East mission, the company enthusiastically joined Secretary Pritzker on a second mission – this time the destination was West Africa. SolarReserve is a leading worldwide developer of utility-scale solar and hybrid power projects which include advanced solar thermal technology. We have more than $1.8 billion of projects in construction and operation, of which $800 million are in Southern Africa. Our aim for the West Africa trade mission was to better understand the renewable energy goals, requirements and timelines of both Ghana and Nigeria with a hope to form relationships with key decision makers and form strong long-term joint venture relationships with local companies. SolarReserve’s world-leading, US-developed, patented solar thermal technology with integrated molten salt storage has the potential to provide both Ghana and Nigeria a cost-effective, reliable, on-demand, zero emission supply of electricity. This solar thermal technology (which can be delivered either alone or coupled with photovoltaics), can provide a cost effective 24/7 reliable alternative to fossil fuel generation with the enormous benefit of zero emissions. This technology could make a huge difference in countries across Africa, with regular power cuts affecting both Ghana and Nigeria’s national productivity as well as the lifestyles of those living in these countries. It’s not surprising we find boundless enthusiasm in the region for reliable renewable energy alternatives. The high calibre of the meetings was incredible, with access to top level government officials and decision makers. One particular high point during the mission in Ghana was meeting John Dramani Mahama, the Ghanaian President, where the group were given the opportunity to ask direct and frank questions - and received clear and fair responses. It was remarkable to have this level of access to the President and a number of the cabinet ministers, and to be able to talk frankly about business opportunities and issues. We left these meetings with confidence in doing business in Ghana.